In 1877 a prospector by the name of Ed Schieffelin staked a claim, and called it Tombstone . By 1881 the mines in the surrounding hills were producing millions of dollars worth of silver and with it came the saloons, a county courthouse, and the now haunted Birdcage Theatre. Within eight years the dream was over, the mines flooded and the town died. In its wake it left hangings, numerous shootings and of course the gunfight at the O.K. Corral. But the ghosts of its past have not found rest. 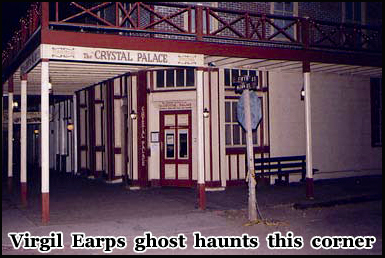 The shadowy figure of Virgil Earp has been seen outside the Crystal Palace Saloon on Allen Street long after his death. 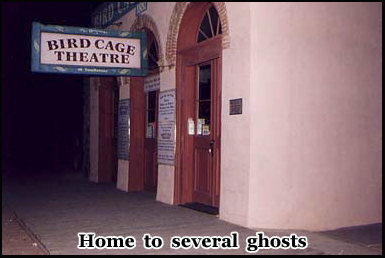 The Birdcage Theatre where the legendary Doc Holiday once played poker, is home to several apparitions, and even the dead of haunted Tombstones Boothill graveyard, can not find peace. 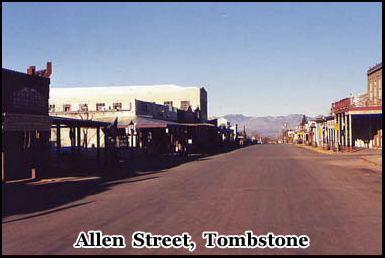 When you think of Tombstone, Arizona , you think of cowboys and gunfights, and of course the O.K. Corral. Tombstones motto is “the town to tough to die”. For unlike many towns of the Wild West, after the gold rush ended it eventually managed to rise again as a major tourist attraction visited by people from all over the world. Like any good Wild West town, it is out in the middle of the desert. The nearest major airport is Tucson . It normally takes about an hour and half from there to get to the town itself. I actually took a detour and carried on down the freeway to Olers near the Mexican border so I could enter Tombstone via some of the desert back roads. Just before you get to Mexico, although you’re still in the United States you suddenly find the shop and restaurant signs are in Spanish and the small border towns occupants are Mexicans. You also start to notice a lot of border patrol vehicles. I headed north back up to Tombstone , I was almost the only car on the road. You may come across a few cattle ranches, and certainly lots of desert, but I doubt the landscape has changed much at all since legendary figures such as Doc Holiday and Wyatt Earp passed through this same way. I got to Tombstone at about 2 pm. I booked into the Larian Motel, which is just a few minutes walk from the OK. Corral and the town itself. I would highly recommend staying there, and the owner is particularly knowledgeable of the area and its history. The surrounding desert is filled with abandoned ghost towns that haven’t fared as well as Tombstone. There is actually a dirt road known as the ghost town trail that takes you past many of them, and if you have the time they are well worth seeing. The first impressions you get of Tombstone as you arrive, is that despite being a major tourist destination it has struck the right balance between retaining its authenticity and providing visitors with a memorable experience. There are many excellent restaurants and bars, but thankfully you won’t find a “fast food” restaurant anywhere. Much effort as been made to ensure that the town still looks and feels much like you imagine it would of done over a hundred years ago. From the motel it was only a few minutes walk to the center of town. Dissecting haunted Tombstone is Allen Street . It is along here that most of the saloons, shops and restaurants where, and still are. It is also where the legendary gunfight at the O.K Corral took place. This is the most famous gunfight that occurred here, but certainly not the only one. The town has had a long and often bloody history and as a result it is said that its ghosts out number its living inhabitants. Allan street itself is closed to traffic during the day, but you still have to watch out for horses and covered wagons. As you might expect there are many people that dress in period costume. There is a recreation of the O.K. Corral gunfight re-enacted several times a day, along with a few other wild west shows, and many of the shops and restaurant workers also dress in character. I remember seeing one of the men that was playing Wyatt Earp at the time, walking across the street after a hard days work to go to his house at the edge of town for a evenings of TV watching. It must certainly be different to working nine to five in a an office like many people do. I walked back and forth between both sides of the street heading towards the Birdcage Theatre. No trip through haunted Tombstone is complete without a visit here. I did plan to return to the theater tomorrow evening when it was dark, but to go inside you have to go earlier on in the day. Between 1881 and 1889 the theater was open twenty four hours a day and had a reputation that spread throughout the entire country, but now it closes around 6 pm. From the outside you can see how well preserved the building is, it looks almost the same as the pictures I had seen of it from a hundred years ago. It was actually abandoned for almost fifty years, and then in 1934 it was listed as a historic landmark and reopened. You can actually go inside the lobby, without going on the full tour. 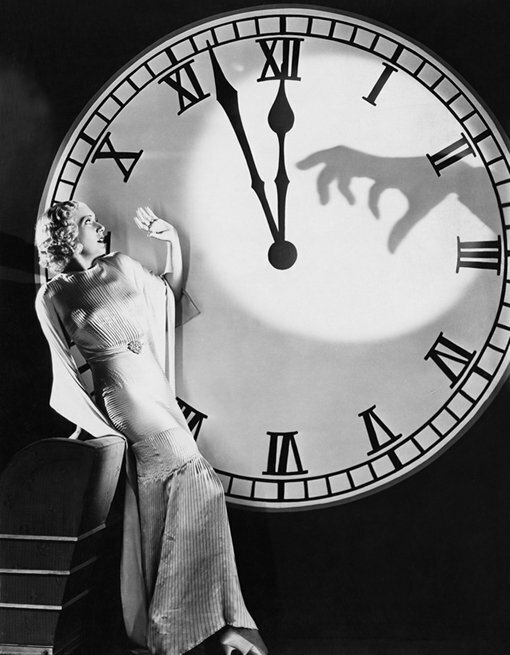 You do feel like you are stepping back in time. Everything is in keeping with how it once was; there is a polished cherry wood bar, with a few whisky bottles and a big mirror behind it. If you look at the ceiling it has lots of small holes. These are actually bullet holes. 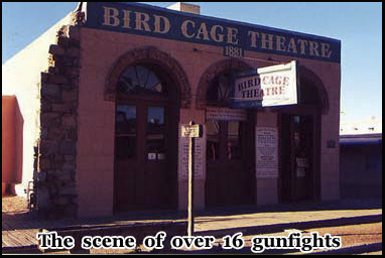 The theater was the scene of at least sixteen gunfights. It is no surprise that with all the violence that has taken place here over the years some of it may have lingered on. There is a small admission charge, once you pay, you enter inside from behind a curtain and there’s a stage and a piano and balcony. It is here that staff have heard music, and the sound of voices. There have also been reports of the unexplained smell of cigar smoke. Several tourists have taken pictures of what they believed to be an empty room only for the pictures to be developed with strange images on them. The theatre itself is on several different levels. 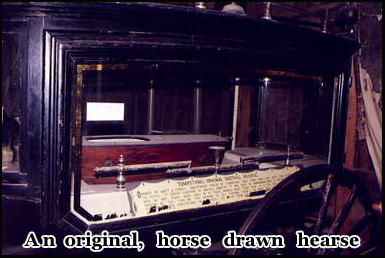 If you walk up behind the stage and into the room at the top, they actually have one of the original horse drawn hearses last used in Tombstone in the 1800’s. You can also walk down to another level that was the theater cellars, which do have a claustrophobic oppressive atmosphere about them. 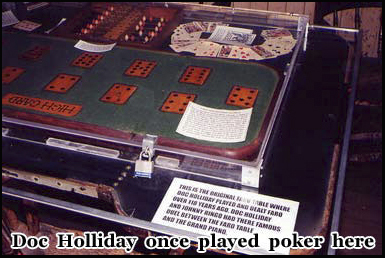 There is a poker table with a perspex cover that Doc Holiday once played on which is also the location of the world’s longest poker game, that lasted eight years and five months. The image of a small boy that was supposed to have died from yellow fever has also been seen in this particular area. I left the theater after taking a few pictures, and headed back down Allen Street . If you make a short detour you can see the original fire station called engine number one. It was from here that the horse drawn fire engines raced out on June 22nd 1881. This was when a massive fire in Tombstone destroyed 66 buildings; this was as a result of an exploding whisky barrel. There was a second fire in 1882 but on both occasions the town was quickly rebuilt. I went back to the Motel then waited until it got dark. Just on the edge of town there is a cemetery called Boot Hill, this is where I would be heading later that night. Several victims of the gunfight at the O.K. 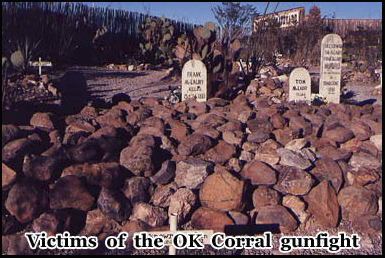 Corral were buried there including the Clanton brother’s, along with many murderers, suicides, and victims of lynch mobs. There have also been several ghost sightings. At about 10 pm, I took along a camera with a flash gun and headed up to the cemetery. It is actually closed at night and there is a fence around it so you can’t go in. But there are parts of the fence where you can lean over and take a few pictures. There is a large car park in front, but at this time of night it was completely empty. There aren’t any houses nearby, except down the hill on the right and beyond that there is just desert. I walked around the perimeter of the fence, there are no streetlamps about and it’s impossible to see more then a few feet. I was in almost total darkness. The wind was blowing up from the desert and only a few feet away from a haunted cemetery. I aimed the camera over the fence and took several pictures. Unfortunately, although they did come out, all you see is the flash, and a few shadows, nothing more of interest. I did however return a few days later to take same pictures during daylight hours. The next morning I got up early at about 7 am as I wanted to walk around the supernatural hot spots of haunted Tombstone while it was still empty before the other tourists arrived. I was also able to get several pictures of Allen Street and a few other landmarks. At that time of day it is very quiet as you might expect, but you do get the occasional person in costume on their way to work, which helps you to imagine how the town once was. I walked pass the Epitaph newspaper offices on the way to Allan street .The newspaper has been going over a hundred years, and you can get a reprint of the original paper that carried news of the famous O.K. Corral gunfight as well as other major events in the town’s history. It got the name Epitaph, after someone suggested that “every tombstone needed an epitaph”. The name Tombstone itself came about after its founder, a prospector by the name of Ed Schieffelin was searching for gold in an area that at that time was inhabited by hostile Apache Indians. He was warned by a soldier that the only stone he would find would be his “tombstone”. One block south of Allen, is Tough Nut street, the site of another haunting. Many people have seen a women dressed in white, but no one knows who she is. Walk two blocks north over from Allen Street , and on Safford Street there is the Buford bed and breakfast built in the 1880’s. Lights have been seen in the upstairs bedroom, and the current occupants believe they have seen the ghost of a man by the name of George Doors who committed suicide nearby. Sometimes lavender perfume can be smelt, and yet no one is wearing it. I walked back on to Allen Street , and to the O.K Corral. It doesn’t open till a bit later on in the day, and this is technically the rear entrance as the gunfight itself actually took place closer to the next street over.Although the gunfight lasted only thirty seconds, by the time it was over, Tom and Frank Mclary and Billy Clanton were dead. Shot by doc Holliday and Wyatt and Virgil Earp. The San Jose hotel just off of Allen Street also contains a ghost. This is believed to be the ghost of Doc Holliday; he has been seen frequently in the room where he once stayed. I had breakfast and by that time it was about 9 am, so I went back to the O.K. Corral which open by now. There is a small museum adjacent to it, which explains the background to the fight, then you have the option of going to a Wild West show which recreates the event, or you can just go to the corral itself. The Wild West show is well done and helps to picture what actually happened a few feet away. 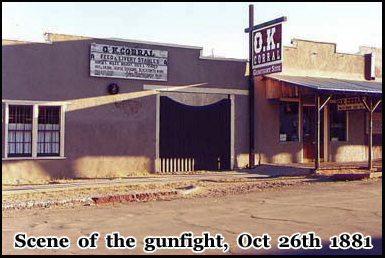 The gunfight took place on October 26th 1881. It was a showdown between Sheriff Virgil Earp his two brothers Virgil and Wyatt, cattle rustlers Tom and Frank Mclaury and Ike Clanton and Bill Clabourne. The whole event occurred in a very small area, at almost point blank range. They now have several mannequins of the key participants, standing on the exact places that they were on the day the gunfight occurred. Many people claim to have seen what they believe to be the ghost of Billy Clanton walk across from the far end of the corral where I am now standing, to the delivery office. 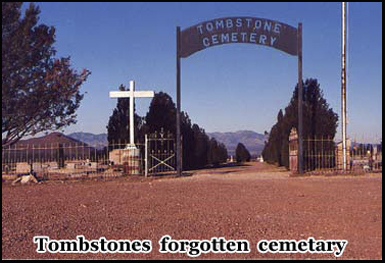 There are two famous cemeteries in Tombstone, one is Boot Hill cemetery and the other is Tombstone cemetery. I decided to visit both of them that afternoon as they are both only a few minutes drive from the center of town. Tombstone cemetery is far less visited then Boot hill which is the one I went to the previous night. However as a cemetery it has a much more authentic feel to it. 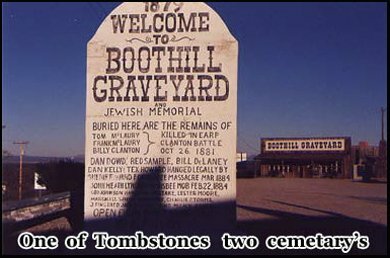 Boot Hill has all the famous outlaws,’ murderers, and suicides as they were not seen fit to be buried with the normal population, but the gravestones are actually recreations not the original ones, and also not necessarily located where the originals once stood. Although interesting, it doesn’t have the same sense of history to it which the Tombstone cemetery does. As I got to Tombstone cemetery it was deserted. There is a huge iron archway at the entrance that says Tombstone, and with the mountains and the desert in the background this does feel like the Wild West. As you look at the graves you will notice aside from the older ones, there are also some that are more recent as it is still used by the local population. You won’t find the grave of Ed Shieffelin, the town’s founder here. But if you drive a few miles out of town which I did the next day, there is a dirt road with a stone mound at the end where he is buried looking down at tombstone from afar. After exploring the cemetery I went up to Boot Hill graveyard. There were quite a few people here already, and there is actually an admission charge to get in. But aside from the more famous victims of the gunfight at the O.K. Corral, virtually everyone else here was the victim of a shooting, or hanging, or killed by Indians. It is extremely well kept, almost too well kept for a cemetery, but you will find lots of cactus growing in, and around the graves that gives it something of an authentic feel. There is one grave that says, Dan Kelly legally hanged March 8th 1884. Another reads John Heath taken from county jail and lynched by the Bisbee mob in Tombstone, February 22nd 1884. This cemetery was abandoned at one time, but has been restored and recreated. 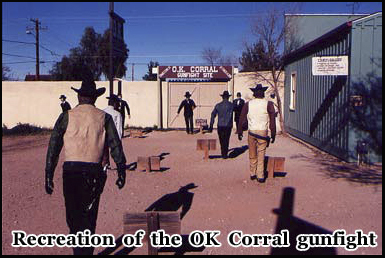 Those involved in the O.K Corral shoot out are the most visited, they are all grouped together on one side. I drove back to Tombstone, and spent some time exploring the newspaper office and also took a circular horse and buggy ride around the town. This is actually worth doing as it’s done at a leisurely pace and the guide will point out many places of historical interest. One of those passed was the old courthouse. This was the scene of dozens of hangings in the late 1800’s when the town’s population was at its highest. At the rear of the building they have recreated the gallows. On March 28th 1884 five men convicted of murder where hung there in one day and the gallows were still in use in the early 20th century. Later in the afternoon I went back to the motel. I wanted to wait until it was dark so I could experience haunted Tombstone and Allen Street with fewer people about. At around 11 pm I got my camera and flash gun and headed up to the northwest end of Tombstone. This is where the Birdcage Theatre is. Like a lot of places the atmosphere around it is very different at night. At this end of the street very few people come at night as most of the bars and saloons are a few blocks down. You can peer through the dark windows of the theatre, and wonder what may be inside. Of course during the 1800’s the theater would be open and the street would have been crowded with drunken cowboys. If you cross back over Allen Street you can make your way along the wooden boardwalk, it is fairly quiet. There are several bars and restaurants open, but most people are in them. Down a block there is the Crystal Palace Saloon. 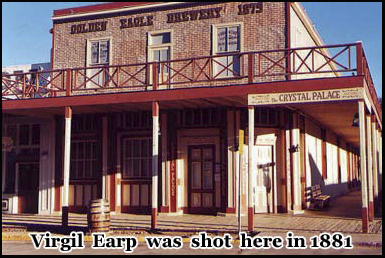 There is a plaque to mark where Virgil Earp was shot in an ambush, but although wounded he was not killed. But his ghost has been seen many times here. If you look back up towards the Bird Cage Theatre there are lots of dark shadows along the street. Further along there is the famous saloon known as Big Nose Kate’s. Big nose Kate herself was rumored to have had a relationship with Doc Holiday for several years. I went inside for a quick drink. This is probably the most famous saloon in Tombstone it is also the scene of several recorded haunting’s including that of Big Nose Kate herself. The town definitely has a different feel to it at night and whether you looking for ghosts or not there is much to see here. And if you do make the trip, make sure you visit the surrounding desert where there are many abandoned mining towns that didn’t survive the demise of the gold rush as well as haunted Tombstone did. Hey Buddy!, I found this information for you: "Haunted Tombstone". 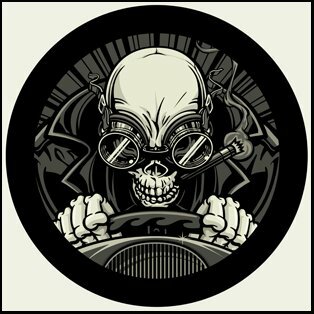 Here is the website link: https://www.chasingmidnight.com/haunted-tombstone. Thank you.